Wes was injured in a snowmobile race in West Yellowstone, MT, in March 2006. 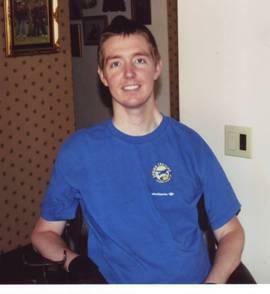 He sustained a C-4, C-5 neck injury which left him paralyzed from the chest down. After several months in the hospital and in rehab at Santa Clara Valley Medical Center in San Jose, he returned home to Elk Grove, CA. Wes was accepted into the architectural program at the University of AZ for Fall 2008. He lived in a dorm and had personal care attendants taking care of him. He graduated in May 2012 with a B.Arch. and that September he was fitted for an adaptive van and has been driving ever since. After a two year job search and approximately 40 interviews, Wes was offered a job in July 2014 with an architectural firm in Davis, CA. This past June he found a place to live which is much closer to his office. Wes modified the bathroom and put in door openers and was ready to move. Then at the end of June, Wes developed a Stage-4 pressure sore. The wound care nurse said that it must have been there for a long time and never opened. When it finally did open, the wound had already advanced to Stage-4 and thus the healing was very slow. Wes is now bedridden 24 hours a day as this is the only way to heal this type of wound — estimated healing time is expected to be approximately six months. Wes worked so hard to achieve his goals towards an independent life and was saddened when faced with the necessity of having to take a leave of absence from his job and not be able to move into his new apartment. Once the wound has healed, Wes can resume using his wheelchair, at first for just a few hours a day, with a gradual build-up to a full day. On August 24, 2015, Wes’ doctor approved a wound vac — a negative-pressure wound therapy that promotes wound healing by applying a vacuum through a specially sealed dressing. The continued vacuum draws out fluid from the wound and increases blood flow to the area and can cut healing time in half. Unfortunately, neither of Wes’ insurances will cover the wound vac and there is a charge of $85.00 a day which over the next six months will be $15,300. To help offset this large expense, a fundraising campaign in Wes’ honor has been established with HelpHOPELive, a trusted nonprofit organization that has been providing community-based fundraising guidance to patients and their families for more than 30 years. All donations are tax-deductible, are held by HelpHOPELive, are held by HelpHOPELive in the Southwest Spinal Cord Injury Fund, and are administered by HelpHOPELive for injury-related expenses only. If you would like to make a contribution please click the DONATE NOW button. Thank you in advance for your love and support in making a difference in Wes’ life and continued progress.